In the mid-1980s, as the world music boom was starting to gather momentum, Rounder Records issued a pioneering anthology, compiled by Christopher Waterman from original 78 rpm recordings from Nigeria, entitled Juju Roots (Rounder 5017). It seemed like a significant moment. The burgeoning interest in African music (which had been sparked off when Island Records had signed King Sunny Ade, in a rather misguided attempt to find a new Bob Marley in Africa) seemed to be showing signs of maturity, as both scholars and ordinary listeners started to seek out the origins of the music they were now able to hear, and to take an interest in its background and development. Juju Roots was (and still is) an outstanding album, hugely informative and offering great listening delight throughout, and at the time some of us thought it was going to be the first of many. Rounder followed it up with Mbube Roots (Rounder 5025), which made perfect sense - just as the first album offered the opportunity to discover the background to the music of Sunny Ade, the new one stood in a similar relation to Ladysmith Black Mambazo, then riding high on the popularity of having been featured on a Paul Simon album which had picked up award after award. Again, it seemed that we were set on the road to discovering the musical riches so long locked up on old, and unthinkably rare, pre-war commercial records. But it didn't really happen like that. Rounder released no more similar anthologies (although it's worth noting that they have managed to keep both sets in print all these years), and there have been only sporadic attempts to carry on this work. It's nearly two decades since Juju Roots appeared, and the number of album releases based on African 78s that have appeared in the meantime can be counted on the fingers of your two hands. Compare this, for example, with the fact that the Document label alone have issued several hundred CDs of African American music from 78s. Heritage released an outstanding half dozen single artist or group sets, mostly from West Africa, compiled by Paul Vernon in the early 1990s, there was an excellent volume covering East Africa in Yazoo's Secret Museum of Mankind series and there have been some tracks on South African compilations, but as far as the pre-war era is concerned, that's about it. Some companies have made an attempt to cover the later period, with Original Music and Retroafric concentrating mainly on the 1950s and onwards, and these seem to have been more successful, although you could scarcely call it a flood (and now Original seems to have disappeared altogether). Why should this be the case? One reason is certainly rarity - pre-war African music on 78 rpm is a lot harder to come by than the African American equivalent. Comparatively few copies seem to survive either in Africa or outside. But that's only part of the story; I'm aware of collections which exist but which have never been called on for reissue, not because of any lack of willingness on the part of the owners. The Heritage CDs drew on EMI's own gargantuan sound archives, wherein we can assume there is plenty more of the same. The British Library has fairly good holdings, too. It has to be primarily a lack of interest. Maybe if Juju Roots and Mbube Roots had sold by the cartload, Rounder would have found ways of producing further volumes. Maybe the typical fan of African music isn't much interested in history, while fans of early recordings find African music too exotic. Whatever the reasons, for those of us who are interested, the appearance of a release like this one has to be a cause for some celebration. Where it differs from any previous release is in its pan-African scope; while previous compilations have focused on a single artist or group (like the Heritage series) or attempted to illustrate the development of a style (like the Rounders), this one rambles far and wide across the country, dropping in on South Africa, Kenya, Nigeria, Tanzania and Ghana - to use present rather than contemporary nomenclature - along the way. There are advantages to this approach, of course - the sheer variety that you can present, for one - but there are problems as well. The flip side of variety is incoherence, and you could argue that only a Western, dilettantist view of Africa could suggest that there is any reason to sit the Darktown Strutters - a 1930s pop group from Johannesburg - down alongside the Islamic vocalising of Nigerians Hadji Amusa and Hadji Mustafa, for example. I think, though, that this would be to invest it with a purpose that is not intended. It would also be to look a gift horse in the mouth. 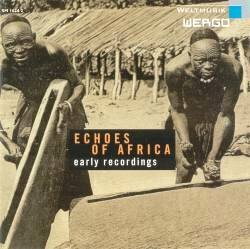 I assume the primary purpose of Echoes of Africa is simply to offer a varied and enjoyable selection of music, and we at least have - in almost every case - both sides of the original record. In any case it is hardly as dilettantist as the Secret Museum of Mankind series, which took much the same approach to the entire world, to quite glorious effect. There are plenty of glories here, too. Top of my own personal list would be the Sackey Band, an acoustic guitar duet, recorded in Accra in 1939. I find this particularly interesting for the fact that you can make connections both backwards and forwards - back to the Kumasi Trio who were making music on a very similar model about a decade earlier, and forward to the guitarband highlife that is still being made today. Further developmental links are to be heard from Willie Gumede and his Concertina Band, whose repetitive, cyclical, riffing dance music seems to represent a stage in the formation of the mbaqanga group sound that - usually with an accordion or sax to the fore - has become well known from the various anthologies of more modern township music that have been widely available in recent decades. Both the Sackey Band and Gumede seem to demonstrate the increasing power of outside influence, but still in an essentially indigenous context. You could say much the same about the Lagos Mozart Orchestra, a delightfully rough and tumble brass band, somewhere along the road to forming the Nigerian highlife style, while the Darktown Strutters (rather improbably referred to on the inlay card as 'doo-wop singers') with their sweet harmonies and jazzy accompaniment, sound like they have taken Westernisation a step further - not that you would mistake their sides for having been made anywhere outside Southern Africa. Another powerful influence, that of Arabic and Islamic culture, is strongly apparent from several tracks, particularly those from East Africa - recorded in coastal cities Nairobi and Dar-Es-Salaam - and it's a pleasure to hear the almost legendary Sitti Binti Saad from Zanzibar, a stunning voice cutting across oud and kanoun (zither) accompaniment. Special mention, too, for Abdo Shamakh's sides, with their beautiful, sinuous instrumental playing and syncopated percussion. These are possibly the latest recordings here, dating from the 1950s, and indeed the male voice which appears on one of them seems to me to have a slightly more modern sound. Similar influences, although apparently more assimilated with sub-Saharan African ingredients, have also shaped another personal favourite here, the sakara music of Abibu Oluwa and his Group, with its ensemble vocals, traditional one-string fiddle and indigenous percussion. Oluwa, recorded in Lagos in the 1940s, seems to be a direct precursor of Yusufu Olatunji, who sold huge numbers of 45s and LPs in Nigeria in the latter part of the 20th century. Ishaku Dan Zhabarumoh and his Group feature a similar line-up, and was also recorded in the same place only a few years before, but the effect is quite different - is this an earlier variant of sakara, or something else altogether? I'm not afraid to admit that there are times when I simply have no idea of what's going on, and I felt this most keenly listening to H M Timayare - Nairobi, 1946. He sings unaccompanied, but every few lines he is interrupted by a chorus of high-pitched, ululating shrieks. It's an extraordinary sound, but apart from its capacity to amaze and intrigue the listener, perhaps not an especially enjoyable one. On the other hand, we also have a group of men from the 6th Kings African Rifles, who offer a more engaging kind of call and response, generating a fair bit of excitement with their rhythmic singing, which sounds like it might have had some kind of military, training purpose. I have no idea of whether Ngoma Dunduri's vocal chorus music had any kind of functional role, but it sounds to me like the kind of thing I'd have expected to find on a folklorist's field recordings rather than on a commercial disc. One by-product of the fact that so few recordings of this kind have been readily available is the paucity of research and published information on the subject. The fact is that very little is known about the early recorded styles of African music, or about the artists involved. Keith Chandler makes the best of it in his notes, in the sense that with little background on which to draw, he has to rely on very general knowledge and a certain amount of conjecture. This isn't to be critical - I'm well aware that the same charge could be levelled at this review, and he is probably as well-equipped as anybody for the task. If the notes turn out to be a fairly prosaic elaboration of the discographical data in the tracklisting, we should still pay tribute to the fact that it is his research, along with Bill Dean-Myatt, that has produced that information in the first place. Reading the notes, I occasionally found myself muttering disagreement, but not from superior knowledge so much as from alternative interpretation. For example, Keith writes that the song sung by Nini Mikie and Her Group is 'clearly from an older tradition'. Maybe it is, but my own speculation would have been that it was probably an example of one of the syncretic styles - like sakara - that were forming in urban West Africa in the pre-war years. Elsewhere, describing the recordings of Mamica, recorded in Nairobi in 1947, he observes that they are 'reminiscent of I K Dairo and His Blue Spots on the opposite coast'. Well not to me, they re not. Except for the fact that both play melodeons, I can't hear any resemblance whatever. On March especially, Mamica seems to be using the melodeon primarily as an additional form of rhythm instrument, whereas Dairo seems to have developed a style that fuses both melody and rhythm and that integrates perfectly with his distinctive Juju sound. Nor would I have said that the accompanists to Al Usthadh Umar Awadh Ban sound even remotely 'as if they just stepped in from the Appalachian Mountains'. But with so few genuine points of reference, I can understand why Keith has resorted to these kinds of comparisons. Where he does have hard information to impart, he does so, and the results are informative and useful. Do I have any complaints? I must admit to a flicker of annoyance on discovering that two tracks already available on CD have been included. The West African Instrumental Quintet's Bea Tsin No.2 was on the Heritage CD by that ensemble, while the Lagos Mozart Orchestra's Ore Mi Kini Se? is on Juju Roots. Given that both earlier sets are still in print, it seems like a waste of two valuable slots on this disc. Apart from that, I can find nothing to carp about. The scope and variety means that there are new things to discover with every play, the sound reproduction is exemplary, given the age and rarity of the source recordings, and the presentation very professional and attractive, drawing on compiler Christoph Wagner's extensive collection of original postcards and, something I'll always award extra marks for, illustrations of original discs, showing company sleeves for Singer Bantu Records, Philips West Africa, Jambo (from Kenya) and a very handsome African Columbia. There's a surprising little postscript to be added here, in that just a few months after the release of this CD, Heritage - after a gap of several years - have just put out a new anthology Early Guitar Music from West Africa, 1927-1929 (Heritage HT CD 33). Drawn from the same source as their previous releases, this offers a hugely enjoyable survey of early recordings of palm wine and other guitar styles, mainly if not exclusively from what was then the territory known as the Gold Coast, and is now Ghana. Performers include George Williams Aingo, Nicholas De Heer, Edmund Tagoe & Frank Essien and J Kwesi Biney. With its sharp geographical focus and concentration on a single instrument - heard in various combinations as well as on its own - but with a broader base than Heritage's previous single artist or group collections, this release brings us full circle to the start of this review and the release 18 years ago of Juju Roots. In that sense you could say that it represents a more mature and insightful approach than that of Echoes of Africa. To be honest, though, on my musical landscape, there is plenty of room for a variety of approaches. I'm thrilled to have both of these releases, and frankly, I cannot imagine anyone with even the slightest interest in early recordings from Africa not wanting to own the pair of them.